Demi Lovato is known as an opinionated girl, and apparently that translates into her hair choices. Demi Lovato’s hairstyles have shifted from lengthy, to loose bob, to shaved on one side with an array of colors tried on for size. She is a style maven who loves to keep us guessing what she will do that hair next. In April of 2009, she was spotted at the premiere of the Hannah Montana film rocking her hair in its naturally darker shade. She wore it with a part in the center, and with ringlets falling to her shoulders. In January, 2010 Demi went black at the People’s Choice Awards. She wore the hair swept back away from her face, adding a beguiling mystery to her blue ensemble. If your natural look feels a little jaded, and you want to add a touch of maturity with some mystery this is definitely a look to consider. 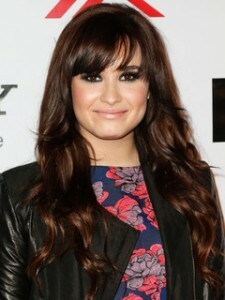 When Demi Lovato started her music career in 2008, her brunette hair had highlights, and she wore it in long soft waves and with playful bangs. For all you teenage girls, this is lovely look. It is not too serious, but it remains stylish. The waves are a classic, and the bangs a dash of chic, so you win all the way. In the fall of 2010, the X-Factor judge switched it up again by brightening her hair with a golden shade of blonde. This lovely change made her beautiful hazel eyes pop, and she wore it with volume at the top and let it fall to the sides. In July, 2011 the Heart Attack singer was spotted in Miami with lengthy locks, in a bright brunette shade while her roots remained a darker brunette. This is an excellent idea if you want to try something new for a short period of time. The extensions are temporary, but they update your look and refresh your style. The singer quickly tired of her foray into blonde and brunette, went red later in 2011. She kept her long locks, but now they were a rich copper color. They say blondes have all the fun, but Demi Lovato’s hairstyle proves this is not true. 2012 spring found the Skycraper singer antsy again, so she lightened the hue of her hair to a golden brown which she styled in long glamorous waves. Her roots are darker, but they lighten in beautiful gradient. This look is a great way to transition out of a color change. Instead of a complete turnaround, ease out of it by altering the current color over a period of time. In July, 2012 she was spotted rocking blonde straight hair rolled into a bun at the front to create a very retro look with a modern twist. For a night out this is a beautiful do, it recalls the bouffant without all the work but makes it contemporary. At the 2012 Teen Choice Awards red carpet, the X-Factor judge showed up with her straight blonde hair, pulled up into a sleek high pony. With the metallic Grecian warrior princess vibe she was channeling, the hair fit right in. Somehow in the amount of time it takes to walk the red carpet, take your seat, go backstage and then on stage, Demi managed to add a new color to her blonde hair: blue ombre while on stage she wore it in a messy down to her shoulders. Even a day is too long to keep the same color. At the 2012 iHeartRadio Music festival, she kept the blonde but ditched the blue-ombre. To freshen the look, she added bangs. With minimal make-up and no jewelry it gave her a mature yet approachable look. One month later, she ditched the blonde for a brunette hue and kept the bangs. When she appeared on Jimmy Kimmel Live in November, 2013 her hair was a bold indigo. She wore it under a hat, and her dark roots were visible. This was the first time she went for a non-natural color, and she seemed like a veteran. Indigo did not last long. In January, 2014, she was spotted in Los Angeles with a new pink do just past her shoulders. How does she do it? With courage and a great sense of style. In May 2014 Demi shaved the side of her head, and for the rest she went with a long ombre vibe. By June the ombre was now purple, later in the year it was short with blonde ombre ends. Demi Lovato’s hairstyles will forever be the stuff of instagram legend, for no one but she can switch their hair color up that much.